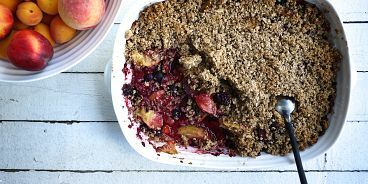 If you, too, are finding that your fruit is ripening so fast in this summer heat that it’s moldy before you know what to do with it…how about a massive, healthy fruit crisp that you’ll be able to enjoy as breakfast for days? Here’s the loose recipe, inspired by the Oh She Glows Cookbook, that I use at least twice a month…. Start by greasing your biggest casserole dish. Round up all the soft fruit you can find, slice it up, add it to your dish, then sprinkle with chia seeds and honey. This creates a bit of a thicker texture. In a separate bowl, mix together about two cups of oats and a big handful of almond meal, chopped nuts and coconut flakes. Mix in about a quarter cup of maple syrup and a few tablespoons of coconut oil. Be sure to vary ingredients based on your preference…remember, this is a loose recipe. Anything works! Bake the dish covered in tin foil for 30 minutes, then another 15 minutes uncovered. Hope you like it! Be sure to try it cold with almond milk.